Can you believe it, five weeks in Australia and I hadn’t had a smoothie yet. Spent my last day putting that right! 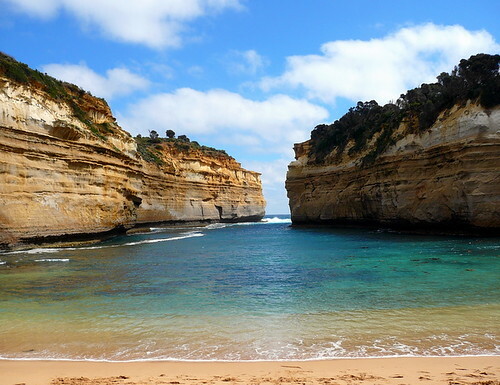 On a day trip to the Great Ocean Road, I saw Bells Beach, Torquay where surfing was invented (and which also features at the end of Point Break), hand-fed some king parrots, chatted to a kookaburra, visited The Twelve Apostles (of which there are now only eleven after one fell down) and paid a visit to Loch Ard Gorge which , as you can see is very pretty. We watched Point Break on the way back to Melbourne. I went to Melbourne Aquarium, which was a bit of a waste of money as it wasn’t very good. 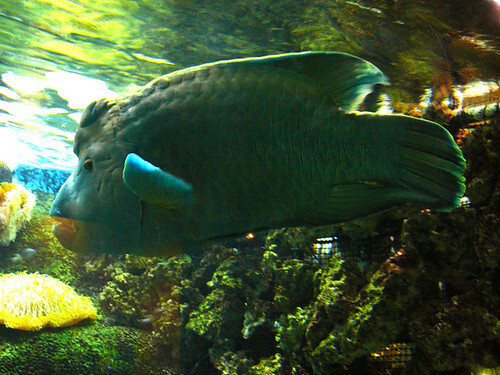 Seeing this Maori Wrasse fish almost made up for it though. I’ve never really liked fish that much (to eat or to look at) but since seeing a couple of these babies, they’re now one of my favourite animals… they’re just so cool! I arrived in Melbourne on an aeroplane on the day of the Melbourne Cup. To be honest, the horse race that the whole of Australia stands still for kind of passed me by. The cabin crew got into to spirit though, wearing hats and doing their announcements in a horse race commentary stylee. Some Japanese horse won. There is also a ‘Batman Street’ and ‘Batman Park’.